The Rockport Film Review: "Dance of the Dead" A Teen Comedy with Zombies! Any story can be made better just by adding zombies! In the mid to late 1990s theatres were jam-packed with teen comedies like the “American Pie” films, “She’s All That”, and “10 Things I Hate About You”, just to name a few. Together with the recent onslaught of zombie movies, it was only a matter of time. 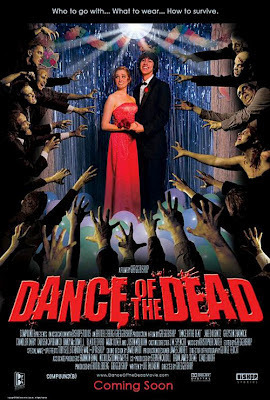 In the spirit of “Shaun of the Dead” and the recent “Zombieland”, “Dance of the Dead” is a hilarious mix of these genres. Released in 2008 and directed by Gregg Bishop, “Dance” was one of the biggest surprise indie horror hits of the year. The teen comedy portion of the film is played like a parody of the 90’s films, while really developing a group of likable characters. All of the stereotyped high school cliques are present and accounted for. You have the stoners, the cheerleaders, the sci-fi club, the rebel, and the rich kids. If they want to survive the zombie apocalypse they need to learn to work together. As with all teen movies the action revolves around the prom.